How fluid moves through compartments depends on several variables described by Starling’s equation. Interstitial fluid is formed when hydrostatic pressure generated by the heart pushes water out of the capillaries. The water passes from a high concentration outside of the vessels to a low concentration inside of the vessels, but equilibrium is never reached because the constant blood flow. Osmotic pressure works opposite to hydrostatic pressure to hold water and substances in the capillaries. 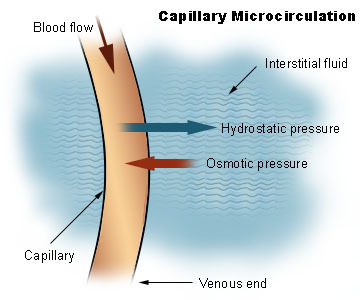 Hydrostatic pressure is stronger in the arterial ends of the capillaries, while osmotic pressure is stronger at the venous ends of the capillaries. Interstitial fluid is removed through the surrounding lymph vessels, and eventually ends up rejoining the blood. Sometimes the removal of tissue fluid does not function correctly and there is a buildup, called edema. The Starling equation describes the pressure gradients that drive the movement of water across fluid compartments. Starling equation: An equation that illustrates the role of hydrostatic and oncotic forces in the movement of fluid across capillary membranes. interstitial fluid: A solution that bathes and surrounds the cells of multicellular animals. Extracellular fluid is separated among the various compartments of the body by membranes. These membranes are hydrophobic and repel water; however, there a few ways that fluids can move between body compartments. There are small gaps in membranes, such as the tight junctions, that allow fluids and some of their contents to pass through membranes by way of pressure gradients. Hydrostatic pressure is generated by the contractions of the heart during systole. It pushes water out of the small tight junctions in the capillaries. The water potential is created due to the ability of the small solutes to pass through the walls of capillaries. This buildup of solutes induces osmosis. The water passes from a high concentration (of water) outside of the vessels to a low concentration inside of the vessels, in an attempt to reach an equilibrium. The osmotic pressure drives water back into the vessels. Because the blood in the capillaries is constantly flowing, equilibrium is never reached. The balance between the two forces differs at different points on the capillaries. At the arterial end of a vessel, the hydrostatic pressure is greater than the osmotic pressure, so the net movement favors water and other solutes being passed into the tissue fluid. At the venous end, the osmotic pressure is greater, so the net movement favors substances being passed back into the capillary. This difference is created by the direction of the flow of blood and the imbalance in solutes created by the net movement of water that favors the tissue fluid. The lymphatic system plays a part in the transport of tissue fluid by preventing the buildup of tissue fluid that surrounds the cells in the tissue. Tissue fluid passes into the surrounding lymph vessels and eventually rejoins the blood. Sometimes the removal of tissue fluid does not function correctly and there is a buildup, which is called edema. Edema is responsible for the swelling that occurs during inflammation, and in certain diseases where the lymphatic drainage pathways are obstructed. The Starling model: Note the concentration of interstitial solutes (orange) increases proportionally to the distance from the arteriole. Capillary permeability can be increased by the release of certain cytokines, anaphylatoxins, or other mediators (such as leukotrienes, prostaglandins, histamine, bradykinin, etc.) that are released by cells during inflammation. The Starling equation defines the forces across a semipermeable membrane to calculate the net flux. The solution to the equation is known as the net filtration or net fluid movement. If positive, fluid will tend to leave the capillary (filtration). If negative, fluid will tend to enter the capillary (absorption). This equation has a number of important physiologic implications, especially when disease processes grossly alter one or more of the variables. Capillary dynamics: Oncotic pressure exerted by the proteins in blood plasma tends to pull water into the circulatory system. This is a diagram of the Starling model. Note how the concentration of interstitial solutes increases proportionally to the distance from the arteriole. The Starling Equation is mathematically described as Flux=Kf[(Pc-Pi)-σ (πz-πi)].